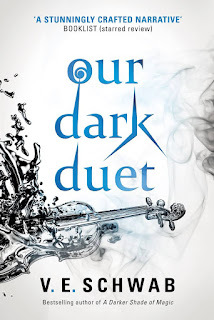 Our Dark Duet is the sequel to This Savage Song and therefore this review may contain spoilers for the previous book. There's a new monster in town and it's a greater threat to humanity than the Malchai, Corsai and Sunai combined. At the start of Our Dark Duet, Kate Harker is no longer in Verity. Instead she's in Prosperity, a city supposedly free of monsters. FTF. Three letters that had come to mean a force, a wall, a war. The monsters are manifests of violent crime, usually a murder or, in the case of the Sunai, a mass murder. The souls of those responsible are marked with red. While the Malchai and Corsai feed on blood and flesh, the Sunai feed on the souls of sinners by playing music. At the end of This Savage Song, Kate's soul was stained red leaving her unable to hear August's music without risking her life. Kate has assumed a new identity and found herself involved with the Wardens, a group of less than prepared hacktivists who have found out that monsters exist. And Prosperity has its own kind. At first, they seem pretty similar to those she knows so well, they can certainly be killed in the same way. Then Kate witnesses an attack in a cafe, one which should have created monsters, instead there was already one there, practically feeding on the chaos it created. And when it looks at Kate, it leaves something behind in her. Back in Verity, August is left trying to clean up the mess left after the death of Callum Harker. He had once provided protection for a price, but now his side of the city is under the control of Sloan and humans are either food or servants. Of course, everyone wants to be on Flynn's side of the city now. The more souls August must reap, the more he feels like he's turning into his brother. These people looked at him and saw something not less than human, but more. Something strong enough to fight for them. Strong enough to win. Of course, their paths end up crossing once more. I found myself tearing through the pages hoping something, anything, would happen which would undo the barrier between them. This is no romance, but you do want the characters to be happy, to not be lonely. I found this sequel much more immersive than the first book, probably because I was already up to speed with the monsters and the rules of this world. I'm a bit sad it's only going to be a duology. The ending is pretty final but there is scope for something else in this universe...maybe. Our Dark Duet is published by Titan Books and is out now in paperback and ebook editions. Thanks go to the publisher for providing a copy for review.